Forty-eight years ago, on this 17th day of January, the first freely elected prime minister of the Democratic Republic of Congo, Patrice Emery Lumumba, was brutally murdered by the United States, Belgium and certain local elites because he wanted the resources of the Congo to benefit the Congolese people. He, as a public servant to his people, fought day in and day out to bring the Congolese people independence from Belgium. On this day we commemorate him, we need to always remember that he gave his life for us to have a better future than he had. His legacy lives and his bullet-proof ideas still resonate in our generation. As I speak to you today, the underlying reason of his murder still remains the central question for the conflict in the Congo since 1996: The underlying issue is who is going to control Congo’s wealth and for whose benefit. To those of you who may not know what is taking place in the Congo, I would like to tell you that Congo is bleeding and dying a thousand deaths. The Congo is the greatest humanitarian crisis in the world today, where nearly 6 million people have died since 1996 – half of them children under the age of 5 – and hundreds of thousands of women have been raped, all as a result of the scramble for Congo’s wealth. The United Nations says it is the deadliest conflict in the world since World War II. Yet, Doctors Without Borders say that it is one of the most under-reported stories of our time. The media is silent, the government is silent and the world is silent. Why is the world silent? “A time comes when silence is betrayal,” says Dr. Martin Luther King. He goes on to say, “Injustice anywhere is a threat to justice everywhere.” It is a scar on the human conscience to know what is happening in the Congo and do nothing about it. As Gaza receives the media attention due to the unthinkable tragedy taking place there, we shall not forget that immeasurable tragedies are taking place in the Congo – with 45,000 people dying every month just for the blings of our lives and the rings of our phones. What can we all do to work with our brave brothers and sisters in the Congo waging a fight for peace and human dignity? In the Congo, 45,000 people are dying every month just for the blings of our lives and the rings of our phones. I will start with you, my Congolese brothers, sisters and elders. I want you to remember what Lumumba said before his death in his last letter to his wife, “that the future of the Congo is beautiful and that it expects for each Congolese to accomplish the sacred task of reconstruction of our independence and our sovereignty; for without dignity there is no liberty, without justice there is no dignity, and without independence there are no free men.” A greater sacrifice on the part of Congolese is needed for the sons and daughters of the Congo. What sacrifices are we willing to make so that our brothers and sisters in Congo can live peacefully as we do in America? What kind of sacrifices are we making so that our Congolese children can go to school as they do here, so that our young mothers are not widowed, so that our sisters are not raped, so that our brothers are not joining militias because there is no better option, so that people do not go hungry in the most fertile land in Africa? What sacrifices are we willing to make so that our Congolese families can live in dignity, as we do here? WHAT SACRIFICE ARE WE MAKING! We are the ones who will rebuild our beautiful country. We need you in every sector of life. The world will help us, but they won’t fight for our country. The world would put pressure on their governments but will not elect our leaders in 2011. The world will advocate for us but will not reform our political system for us. We must sacrifice our time to the Congo, our life if necessary. Some of us are Congolese Americans and should pressure the American government by lobbying day in and day out to alleviate the suffering of our brothers and sisters at home. Some of us work for hospitals and could help in sending medical supplies to many clinics that need it at home. Some even own companies, and they could help in any way possible. Our people on the ground need your help. Always remember our origin. They can take you out of the Congo, but they cannot take Congo out of you. We need to support our people at home. The future of the Congo is bright, as I can see in the eyes of students and people I meet all over the country. Fifth graders at Kipp DC: Will Academy, a middle school in Washington, D.C., raised $800 in one day for the movement after a presentation about the conflict taking place in the Congo. The Avonside Girls’ High School students mobilized their whole school to join the international cell-out (cell phone usage boycott) and had a public relations firm help them to get the word out on the war in Congo in their community. Not to forget my beloved Aggies, North Carolina Agricultural and Technical State University students, who went around the campus and collected 1,200 student signatures and the endorsement of more than 40 student organizations’ presidents so that our university would join the Break the Silence Movement and receive an official letter of recognition from the chancellor of the university. The forces against the Congo are tremendous. We want you to join the global movement to break the silence around the atrocities taking place in the Congo. We hope that this new wind can be TODAY what the Free South Africa movement was yesterday. Bring your talents, your ideas, your skills to help us support the Congolese people. Call your local leaders, radio stations, inform your professors in your universities, talk with Congolese as they try to find healing from this suffering. Let people in your network know about the Congo. Just imagine Congo’s spectacular potential, which ranges from its fauna and flora to its untapped reserves of resources. It is a storehouse of strategic minerals we use in our daily lives. Sixty-four percent of the world’s reserves of coltan are found in the Congo. It is a part of the second largest rainforest in the world behind the Amazon. It has the hydro capacity to provide electricity for the entire African continent, southern Europe and parts of the Middle East. It could feed the entire world through 2050. Did you know that the oldest mathematical artifact was found in the Congo? It is called the Ishango bones and is about 22,000 years old. All the potential of the Congo can be realized with unity, dedication and the submission of individual and personal aspirations to the collective will. We ask that you BREAK THE SILENCE in your daily lives and support us in our quest to bring about fundamental changes in the Congo. Lumumba stated, “We are not alone. Africa, Asia and free and liberated people from every corner of the world will always be found at the side of the Congolese.” I hope you will stay engaged in our quest to bring peace and stability in our Congo and finally start rebuilding our country and help it rise like a phoenix. Thank you, God bless you, God bless the Congo! Kambale Musavuli is spokesperson and student coordinator for Friends of the Congo. He can be reached at Kambale@friendsofthecongo.org. 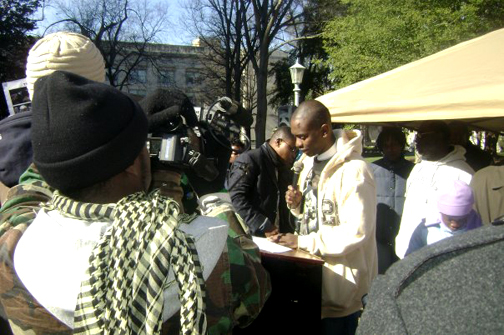 Call 1-888-584-6510 or visit CongoWeek.org to arrange for the Break the Silence Spring Speakers Tour to come to your community – your university, high school, organization, labor union or business group. Become a Friend of the Congo at FriendsoftheCongo.org. This superbly produced film is the beginning of a journey into the hearts and the minds of the Congolese in America, as they Break the Silence and fight to SAVE CONGO! The filmmakers are Charles Vakala and Eric B. Ndelo, who also did the editing, of Divine Righteous Children. It transports us to the march and rally in Raleigh, N.C., on Jan. 17, the 48th anniversary of the U.S.-backed assassination of one of the greatest leaders of the 20th century, Patrice Lumumba. 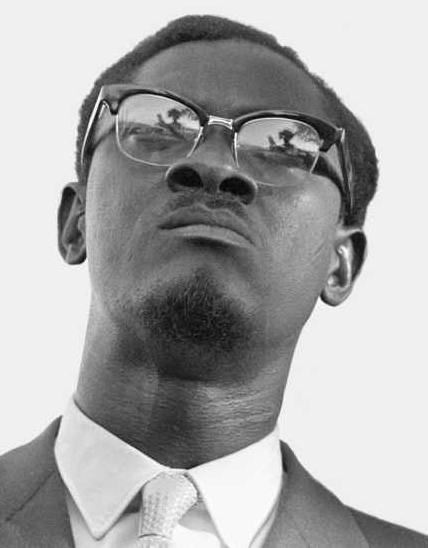 Belgium apologized for the assassination of Lumumba, 48 years later, several days before January 17th. The U.S. has not and I don’t know of any movement to urge Barack Obama to do so, but it has occurred to me that local legislators, like San Francisco’s and other municipalities’, like Greensboro’s, might apologize, and thereby encourage Barack Obama to do so.